Ping a co-worker in the head with a foam dart and you’ll get an annoyed reaction at worst, but soak a co-worker with a water gun and you’ll find yourself in a meeting with HR. 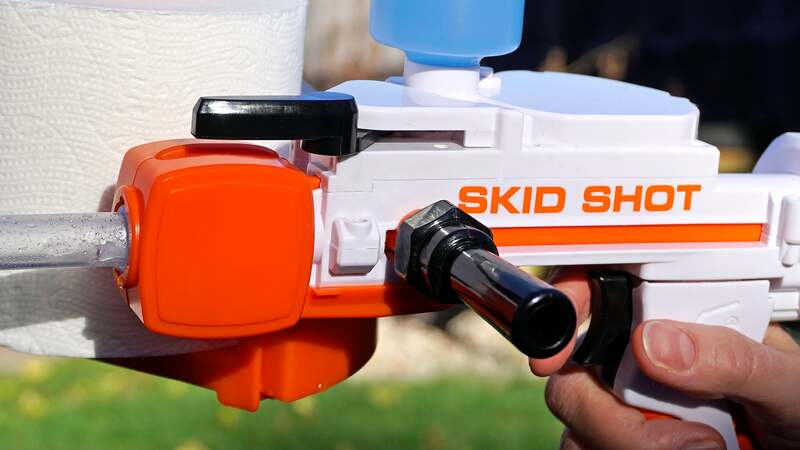 Jakks Pacific’s new Skid Shot blaster falls somewhere between the two. 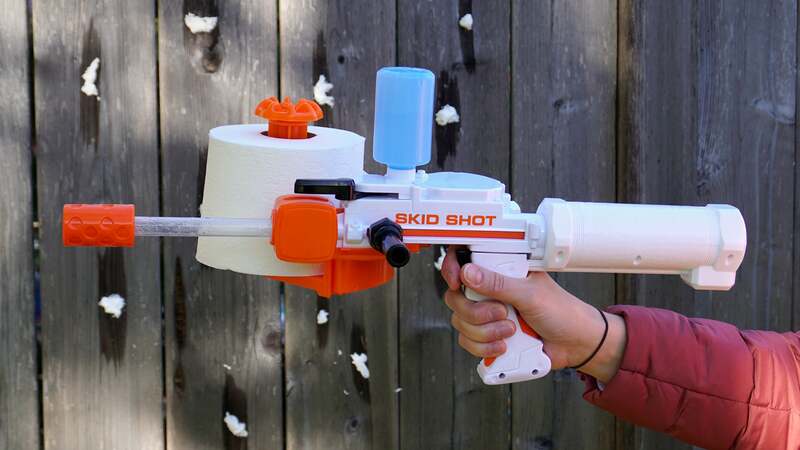 It automatically ingests and turns squares of toilet roll into sopping wet spitball projectiles that won’t damage electronics like a Super Soaker can, but will create enough of a mess to make you feel like a teenage delinquent again. WHAT IS IT? 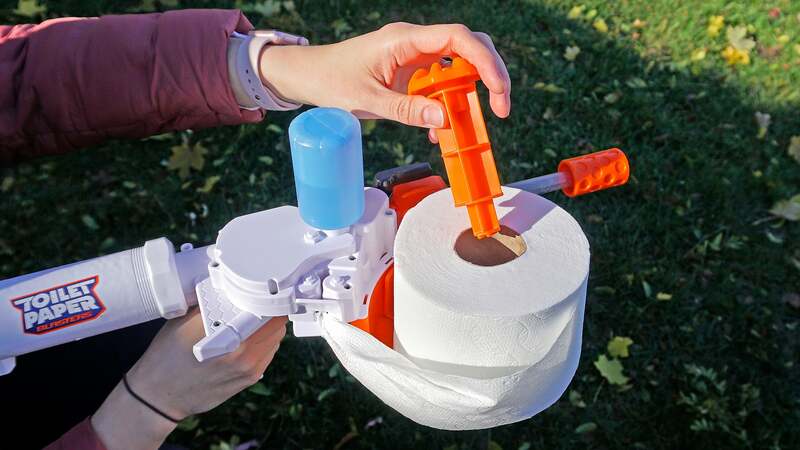 : A blaster that automatically creates and fires toilet paper spitballs. LIKE: It's one of the easiest ways to make a lot of enemies. DISLIKE: Range and accuracy can be wildly inconsistent. Do you remember the last time you fired a spitball at someone? Probably not, because it dates back to a time when the younger version of you didn’t recoil at the thought of putting a wad of tissue or toilet roll in your mouth, soaking it in saliva, and then cramming it into one end of a narrow straw. 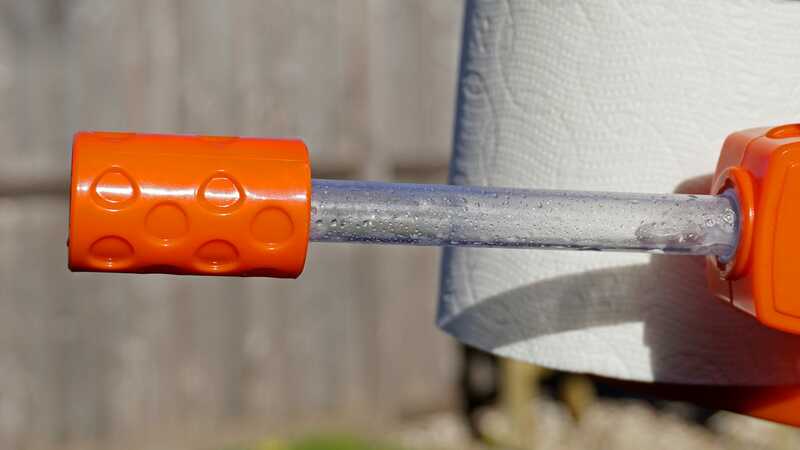 A removable spindle allows you to load a single toilet roll which provides well over 150 rounds of ammunition depending on how large a roll you’re able to mount. 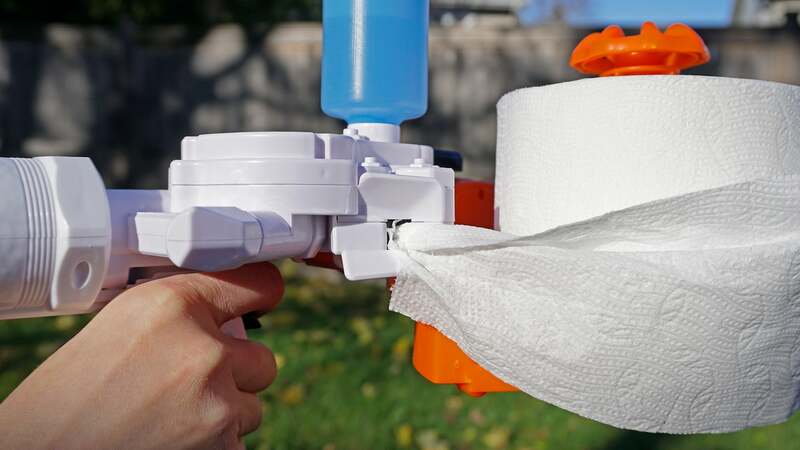 The toy’s packaging recommends sticking with two or three-ply TP for best results, which will reduce the number of shots you can fire before a reload is needed, but will also result in better performance (heavier spitballs) when you pull the trigger. 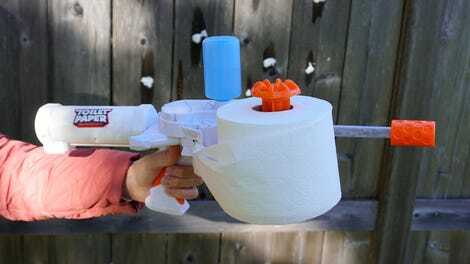 The most complicated step in prepping the Skid Shot is feeding the toilet roll into the blaster’s intake. 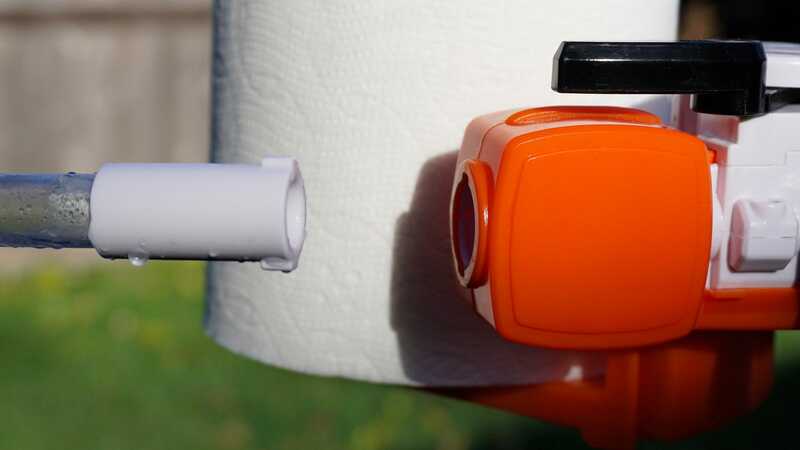 You need to roll the end of it into a long thin strand which you then cram into a small hole before pulling one of the blaster’s levers multiple times to feed enough toilet roll into the toy so it’s ready to fire. You’re not done yet, though. 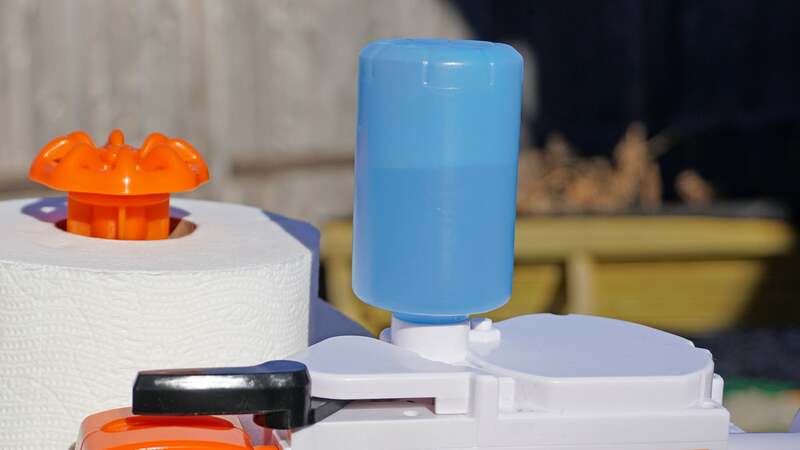 Priming the Skid Shot is a manual process that requires first sliding a smaller lever forward and back to advance the next square of toilet roll, and then sliding a larger firing lever forward and back to compress the spring-powered mechanism that generates a forceful blast of air. It sounds complicated, but in practice, it’s actually a satisfying feeling, and I always prefer toy blasters that don’t run on heavy batteries. But at the same time the Skid Shot is a toy that sells for just £23.40, and at that price point, I’m impressed it works at all. Nerf blasters are designed to fire a very specific size and shape of foam dart each time, and even then you’ll still get the occasional misfire. Every time you prime the Skid Shot you’re creating a soaking wet ball of paper that’s a completely different shape than the previous one. Had Jakks Pacific put this on toy store shelves with a price tag north of £40, I’d suggest sticking with a traditional straw and box of tissues if you can stomach it. But at £23.40, you’ll probably have enough fun with this toy to warrant skipping a few fancy coffees during the week. 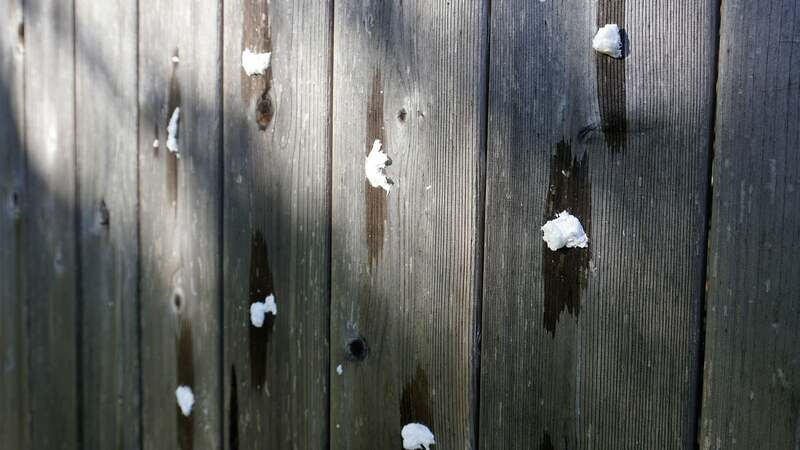 Your results will vary wildly every time you pull the trigger, but when it does work, and a spitball leaves a giant soaking wet mess on your target, you’ll have a hard time suppressing a mischievous smirk. Performance is inconsistent, but you can occasionally send a spitball flying over 30 feet. For less than £25 it works well enough.